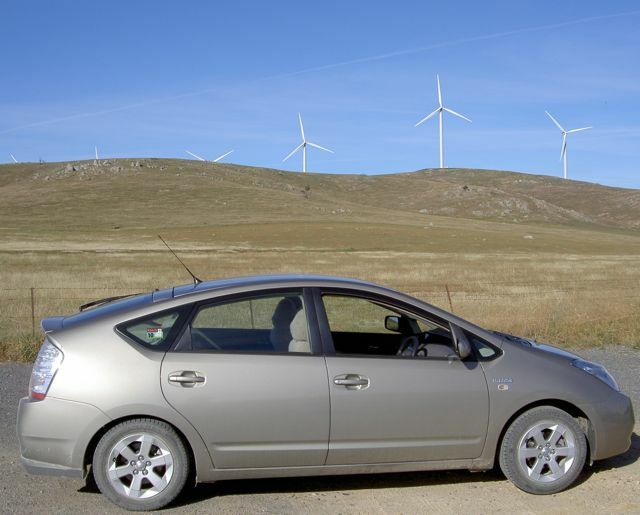 Just how serious is Canberra about carbon emission reduction? Will the ACT government take the lead on this issue or will it be a case of, “when the people lead the leaders follow”? 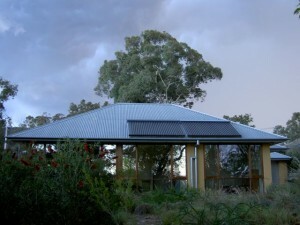 Take Canberra’s Sustainable House for example. We are serious about greenhouse gas emissions – it is both our passion and our business afterall. Three and a half years of living in our home has seen us progressively move beyond carbon neutral into the zone known as carbon negative. We will not sell, trade, or otherwise deal away the emission reductions made in our home. 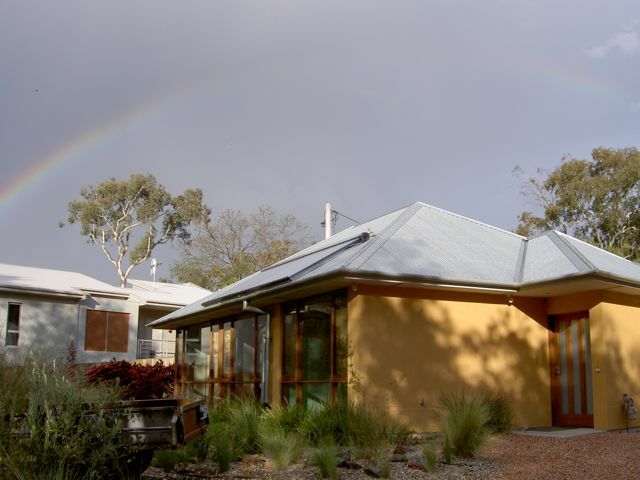 We have not sold and will not or trade away the Renewable Energy Certificates (RECs) deemed on any of our renewable energy systems, something that is commonplace with the installation of solar hotwater and electricity systems. Carbon dioxide and other greenhouse gas emissions are everyone’s responsibility. I spoke with Anne O’Brien of love40percent.org at the Inner North Community Fair, Sunday 16 May 2010. Love 40% is one of a several community groups working hard to encourage the ACT Government to make responsible decisions on carbon emission reductions. We are talking a reduction of 40% by 2020 at a minimum!!!! I would encourage Canberra residents to sign the love40percent.org petition. Why not download the petition from the link below and ask your friends, family and work colleagues to sign on to this critical 40% Carbon Dioxide emission reduction by 2020. Petition deadline has been extended until 30 June 2010. Canberra’s Sustainable House kitchen garden is a always a busy and inspiring place. Seeds have been sown for the winter period and the warmth from the extended season allowed us to plant a little later than usual. Broccoli and cabbages planted in February are looking good. 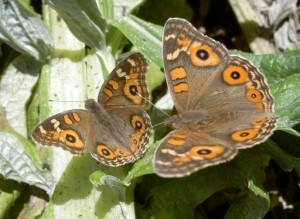 The warm sunny days have been ideal for butterflies such as these Meadow Argus (Junonia vallida) that are prolific in our artichokes. 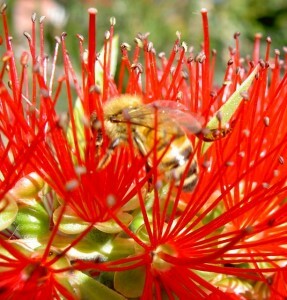 The bottlebrushes are opening up, providing food for our local feathered friends. Taking a break from the garden I stood and observed a spectacular green grasshopper. Nearing the end of its life and missing one hind leg it struggled up the eastern wall, presumably seeking some shelter under the eave. Insects are well a tuned to coming weather. It was fascinating to observe this behaviour, knowing that storms were imminent. The rain arrived, intense and accompanied by thunder and lighting. We have another 5000 litres in our tank. The kitchen garden looks fresh and clean. Meanwhile, in the grape vines, leaves have turned a beautiful autumn red and are now beginning to drop their leaves. Impeccable timing by a pair of Crested Pigeons nesting in the vines, their two chicks should be fledged and depart next week. The leaves that obscured and protected the nest are also moving on. The second week of May is the time for pumpkin lovers to visit the nearby village of Collector for the annual Pumpkin festival. 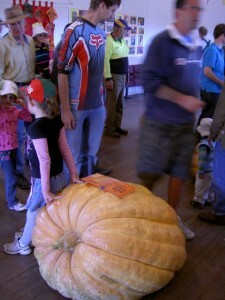 Great food, great atmosphere and pumpkins of all shapes, sizes and colours. A wonderful way to raise funds for local community projects. Returning via a back road to gain some impressive views of the wind turbines at Capital Wind Farm. 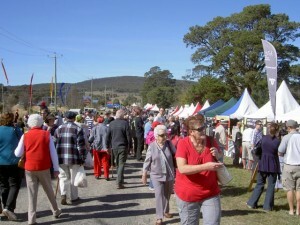 Drop by for a chat at Nick’s stall at the Collector Village Pumpkin Festival in May 2011.